Utah proved its worth with a clean sweep of 20th-ranked Washington at home Friday night. It is the first sweep for the Utes against the Huskies in the all-time series. The Utes, who received votes in this week’s VolleyMob power rankings, overcame their opponent despite trailing in attack percentage (.273 to .265), on the block (9 to 5) and at the service line (6 to 2). 17th-ranked Washington State battled it out for a 4-set victory on the road at RV Colorado Friday night. The Cougars have now won four-straight Pac-12 matches. 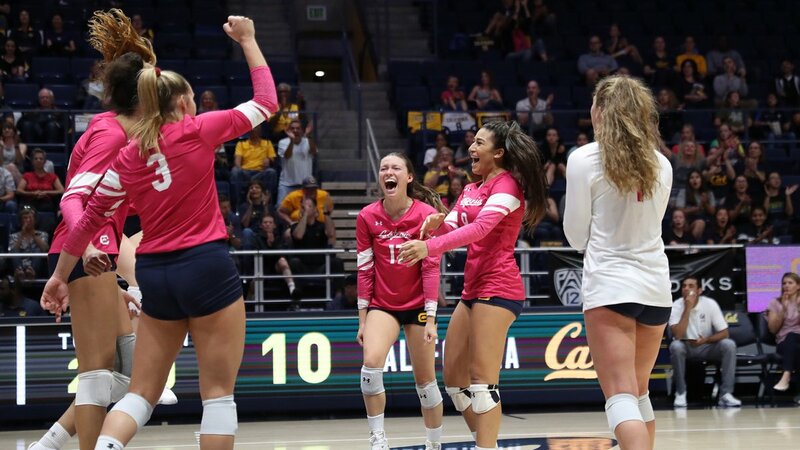 California upset 19th-ranked UCLA in straight sets on the road on Friday night. The Golden Bears earned their second-straight sweep with a .270 attack percentage, 7 blocks and 8 service aces. 22nd-ranked Arizona earned its third Pac-12 win in a row with a sweep of Oregon State Friday night at home. The Wildcats were dominant in the match with a .402 attack percentage, while holding the Beavers to .159. 16th-ranked Oregon handled Arizona State in straight sets on the road on Friday night. The Ducks hit .206, while holding the Sun Devils to a dismal .074 attack percentage for the win. 2nd-ranked Stanford left no doubt on the road, besting 11th-ranked USC in straight sets Friday night. The Cardinal, which leads the league with a perfect 11-0 mark, overcame the Trojans with a .373 attack percentage, 8 blocks and 6 service aces. Sunday, Oct. 28 Oregon at Arizona Tucson, Ariz. 2 p.m.
Washington at Colorado Boulder, Colo. 2 p.m.
Oregon State at Arizona State Tempe, Ariz. 3 p.m.
California at USC Los Angeles, Calif. 4 p.m.
Stanford at UCLA Los Angeles, Calif. 7 p.m.